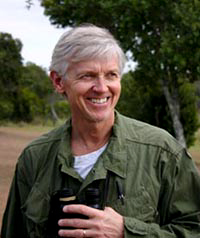 Dr. Butynski is a conservationist and ecologist who has worked in Africa since 1970, mostly in Botswana, Kenya, Uganda and Equatorial Guinea. He obtained his MSc and PhD from Michigan State University. He has published more than 170 articles and is currently a member of four IUCN/SSC Specialist Groups (Primates, Antelopes, Afrotheria, and Wild Pigs) and Vice-chair for Africa & the Middle East of the IUCN/SSC Wild Pigs Specialist Group. Dr. Butynski has served as Director of the Institute of Tropical Forest Conservation in Uganda, Director of Conservation International’s Eastern Africa Biodiversity Hotspots Program, Director of the King Khalid Wildlife Research Centre (Saudi Arabia), Vice-Chair of the Africa Section of the IUCN/SSC Primate Specialist Group, and Senior Editor of the journal African Primates. He is one of four Senior Editors of the recently published Mammals of Africa (6 volumes). Julius joined Lolldaiga Hills Ltd. in early 2014 after working as a guide/naturalist in Laikipia’s Ngare Ndare Forest for 7 years.When not guiding Lolldaiga’s visitors, Julius helps with biodiversity surveys and with the camera trapping project. In October 2014, Julius attended a conservation training programme at the German Primate Research Centre, Göttengen, Germany.